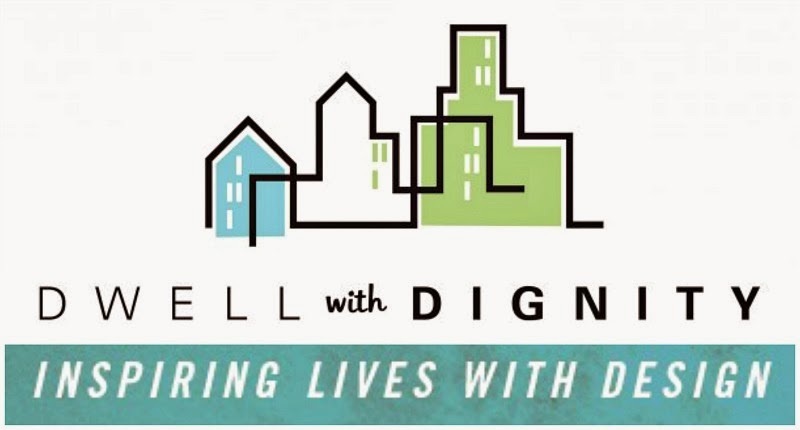 I'm so happy and excited for Dwell with Dignity! 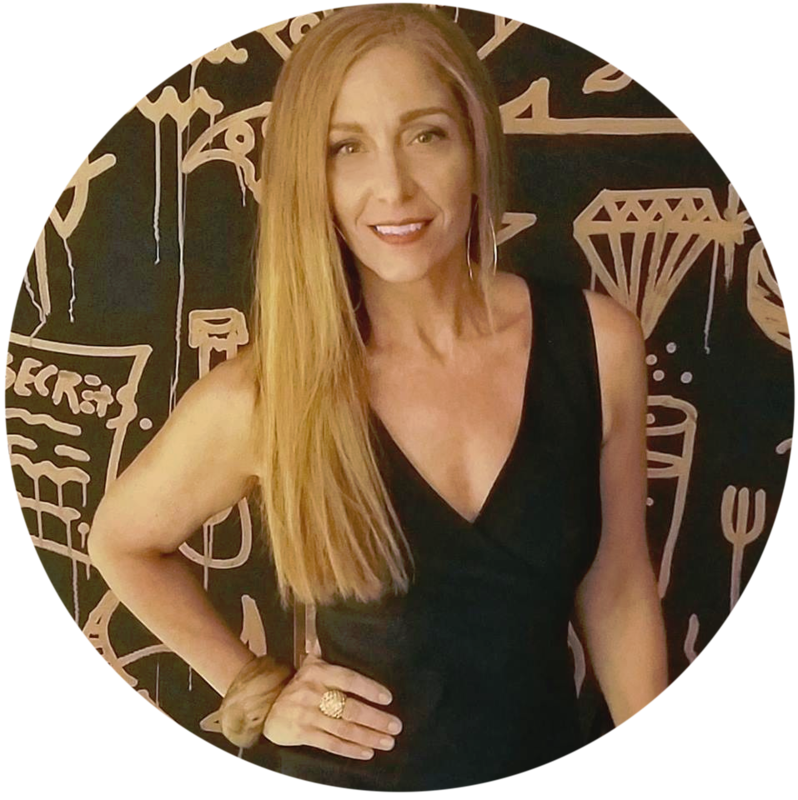 Dwell with Dignity is a Dallas-based non-profit organization driven by one amazing mission: to use interior design (and even now art!) to bring hope and happiness to families struggling with poverty and homelessness. I’m a believer in Dwell with Dignity’s cause. 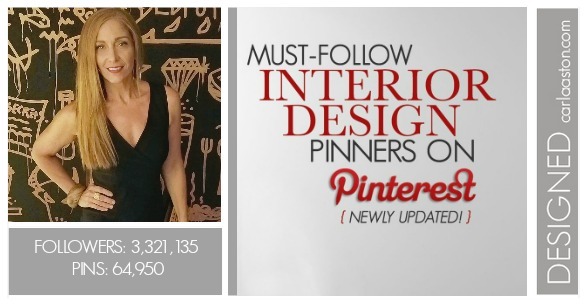 Since first learning about Dwell with Dignity on the Nate Berkus show almost 3 years ago, I’ve been watching them grow, helping to spread their word through sharing on social media, and hoping for other chapters to open outside the Dallas area so I can volunteer. 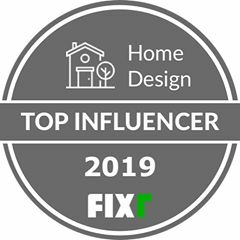 And it looks like that may be coming true, now that Dwell with Dignity has branched out to the Atlanta area with their first home project – All the more reason why I was honored to guest blog about Dwell with Dignity on the Hadley Court blog! 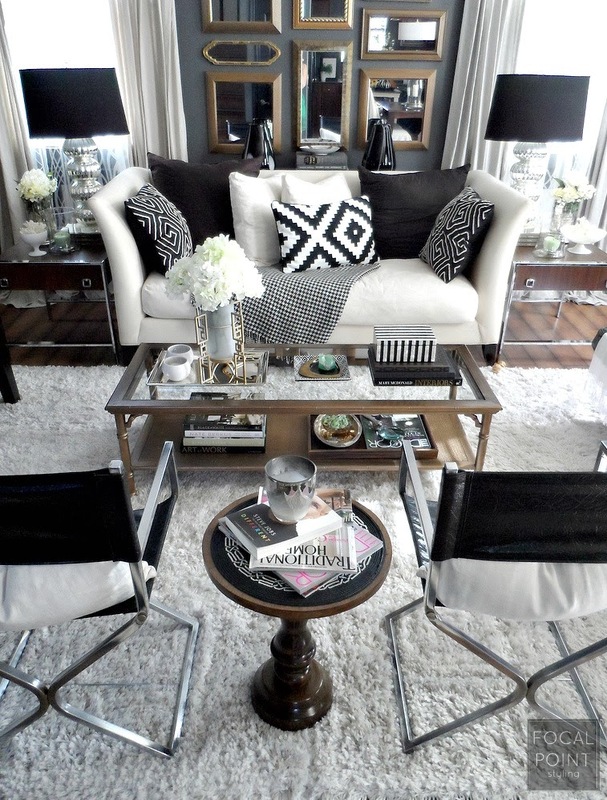 Visit the newly re-designed Hadley Court site to read my guest blog contribution - Meet Dallas' Dwell with Dignity - A Non-Profit Organization Inspiring Lives With Design, plus get info for their upcoming Spring Thrift Studio, whose Honorary Chair this year will be Ronda Rice Carman, Founder of the lifestyle blog, All The Best Blog | A Passport to Stylish Living. 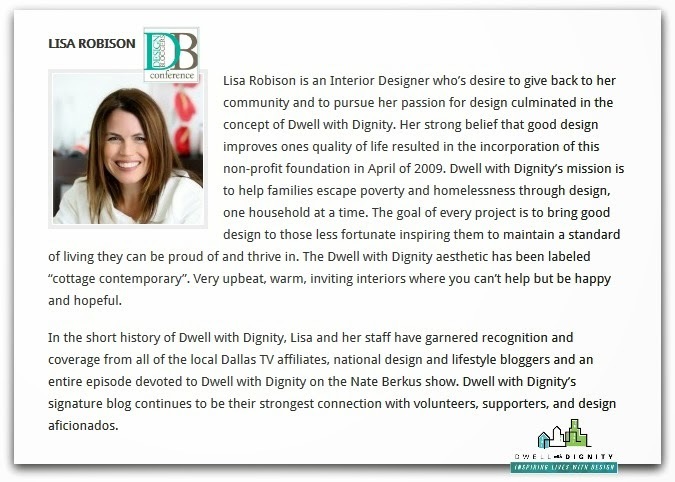 Dwell with Dignity's Founder & President Lisa Robison, along with Vice President & Director Kim Turner will both be guest speakers at this years Design Bloggers Conference, coming up this weekend in Atlanta. 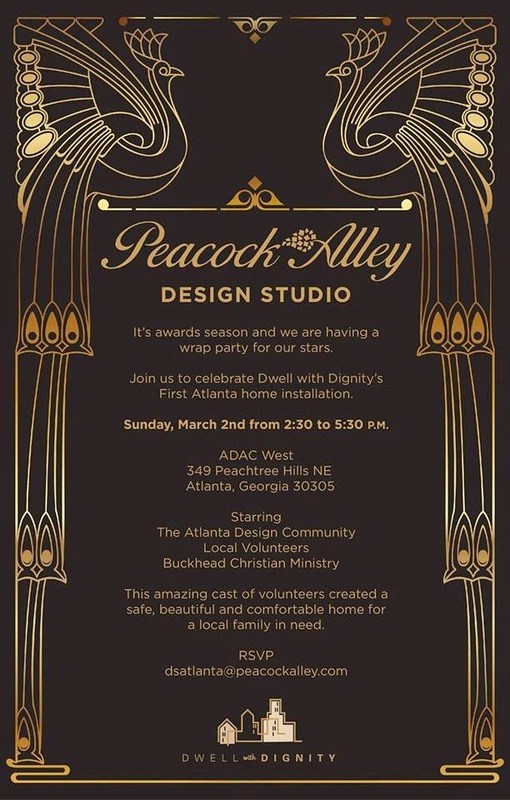 One of the supporters for Dwell with Dignity – Peacock Alley – will be hosting a “Wrap Party” this Sunday from 2:30 – 5:30 pm in honor of Dwell with Dignity wrapping up their first ATLANTA home installation and first installation outside of the Dallas Market! 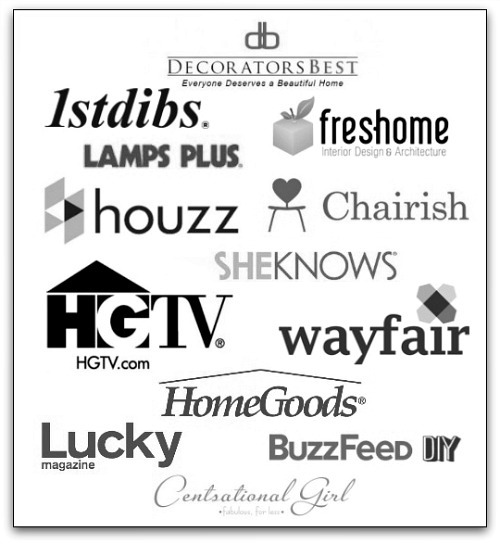 What a wonderful way to kick off the Design Bloggers Conference this year, starting Sunday! 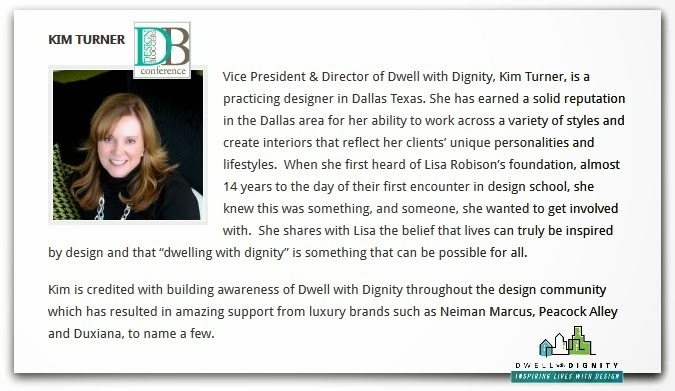 I so wish I could have attended, especially this year for this milestone maker for Dwell with Dignity. 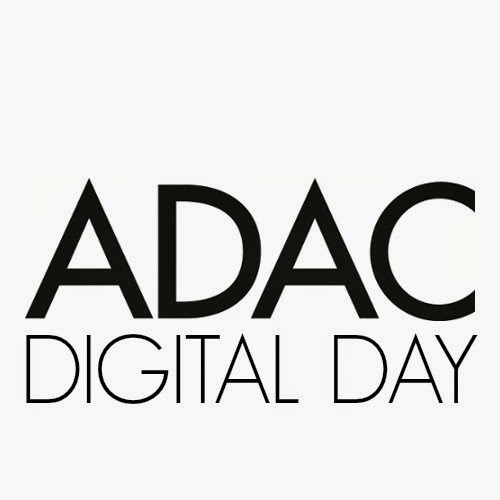 I am though grateful to have met both Lisa & Kim at last years Design Bloggers Conference, and I'm sure Leslie Wood will get to speak with them when she attends with Leslie Carothers this weekend. 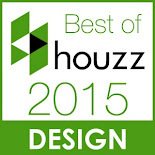 Definitely be sure to visit Hadley Court to read all about it - here. 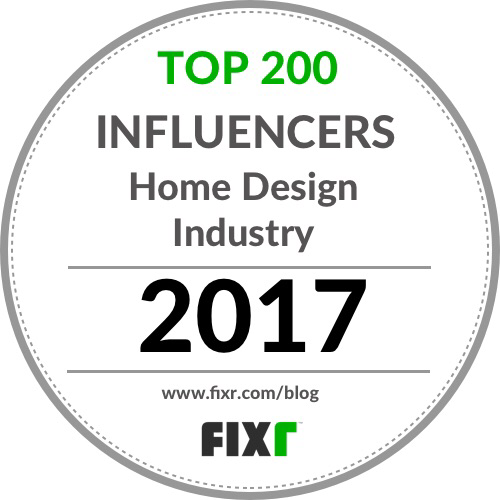 Congratulations Dwell with Dignity and here's to much continued success, changing and inspiring lives with design, one household at a time. 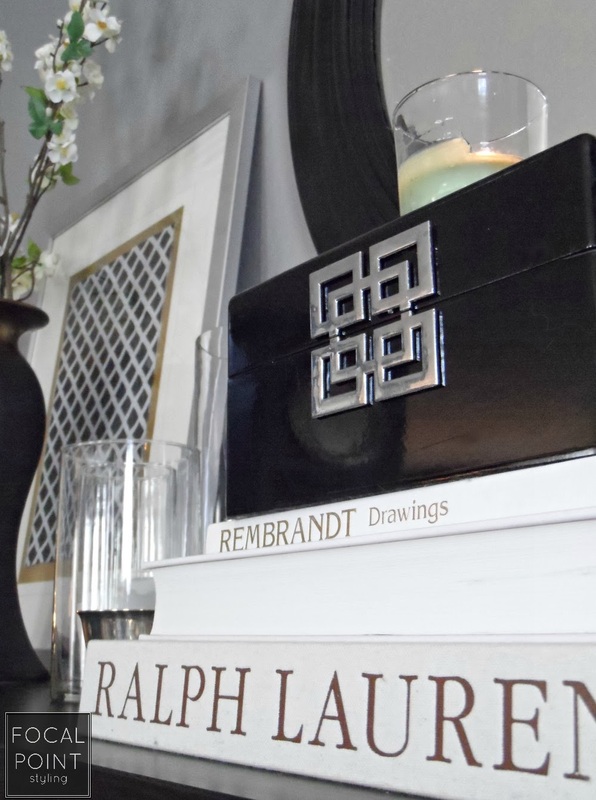 Over the past few years, bookshelf styling has become increasing popular. 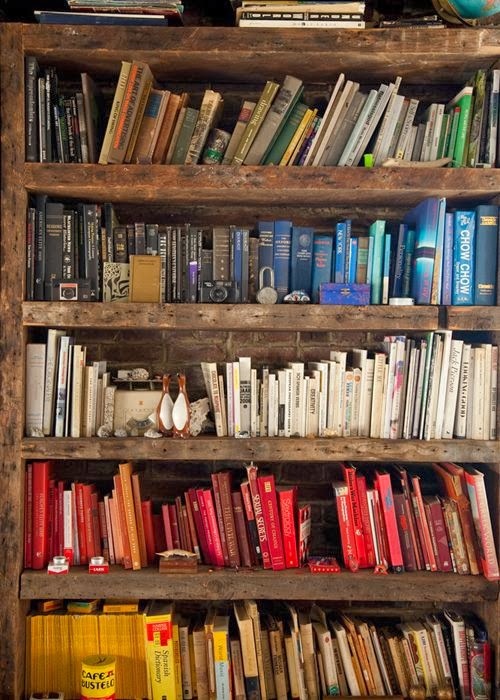 Bookshelves are not only a means of a book lovers storage, but bookshelves can also creatively tell the story of you. Creative displays of books, mixed with vintage finds, travel treasures, framed photos, potted succulents and even jewelry all help to tell the story of your lifestyle, your passion, your family, your past or even a season. Some homes already come with enormous bookshelves built in, and some can be custom designed, or created by a homeowner themselves. 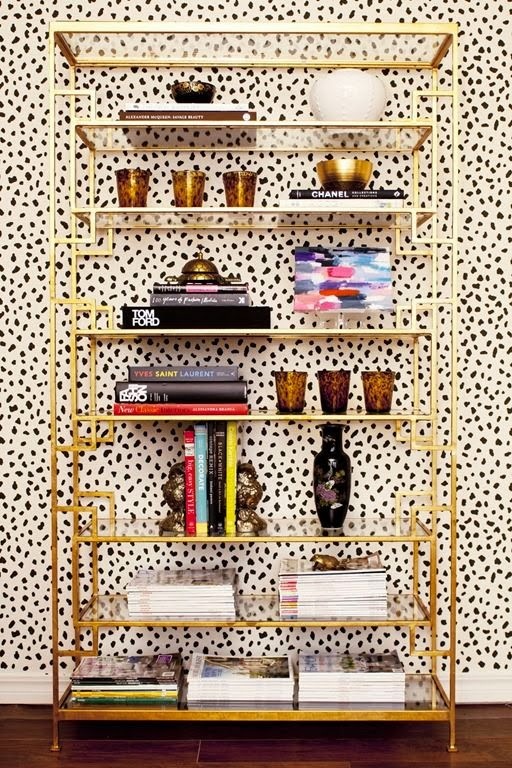 Some bookcases are two toned: having a backdrop inside of textured or patterned wallpapers, or even just painted a contrasting color. 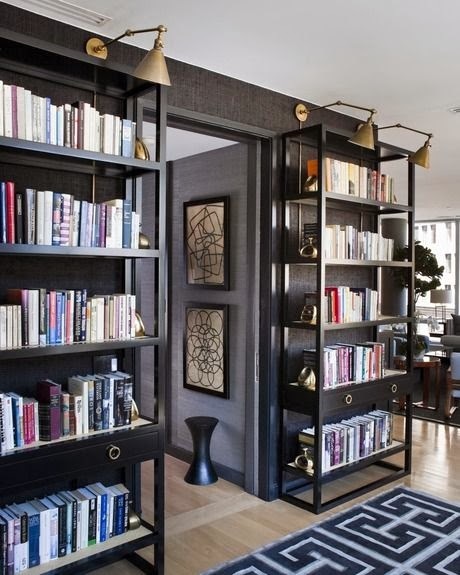 Not all bookshelves are heavy furniture pieces - some can be just as strong but have a more light an airy feel plus allow some light to travel through them with glass shelving. Collecting books to fill a bookshelf can be a pricey expense - an alternative to buying all new books is to buy used - via book fairs, vintage and thrift stores and even some used book versions are available through Amazon. 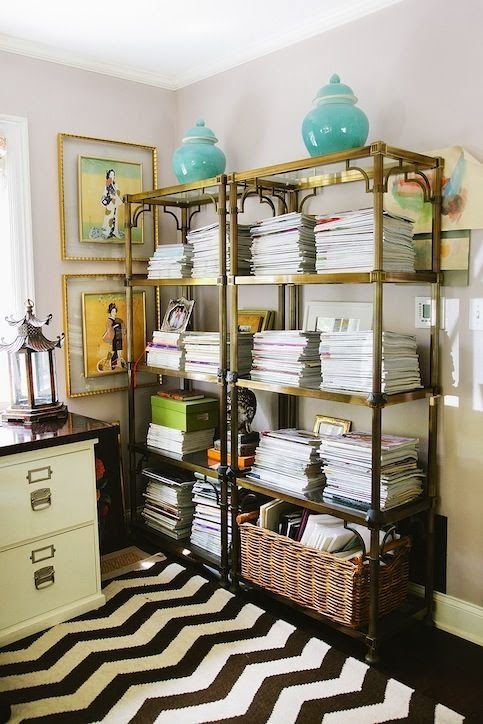 An option to books: Le Catch's Marlien Rentmeester (former Lucky fashion editor) uses a pair of brass etagères for her stacks of magazines, including every issue she ever worked on. 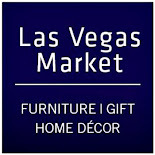 Open shelving, usually made or metal and glass also known as etagère, are also a popular trend for bookshelf design. 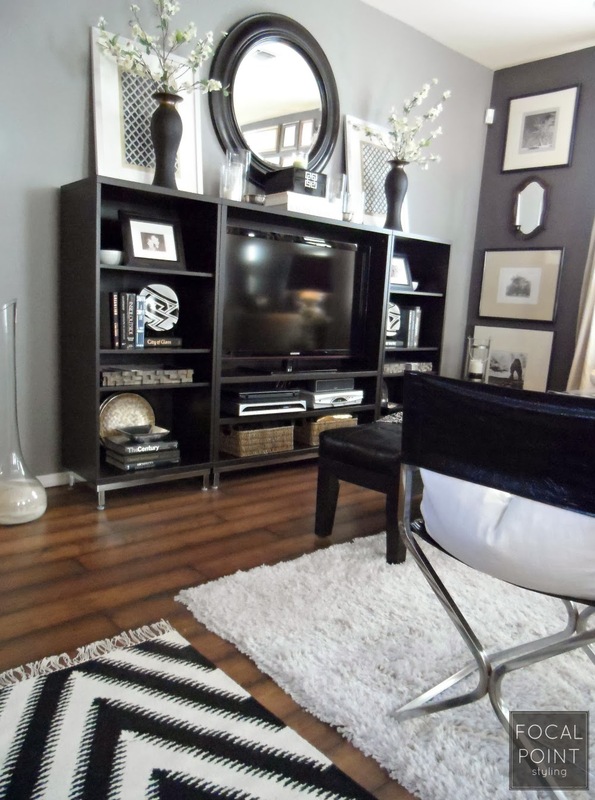 Etagère help keep a more open feel to a space, vs. heavier built-ins. 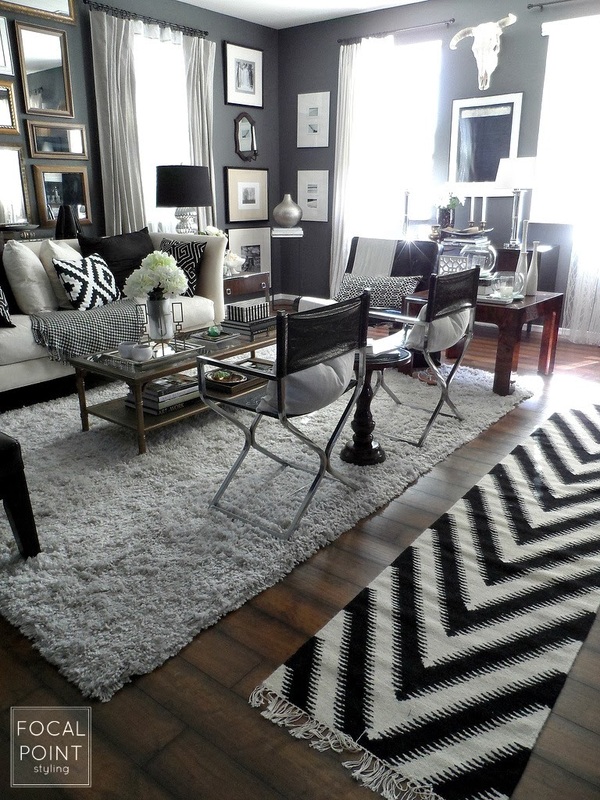 For real drama, and to create a focal point in a room plus give the space balance, etagères look lovely in pairs. Paired etagères work great in a small office space or a dining are that has been converted into an office space. Etagères can also flank a centered window or doorway, again bringing balance to a space. 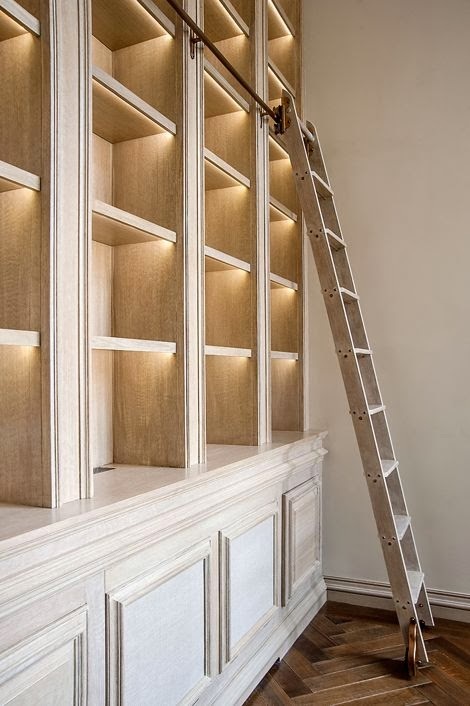 Custom built-ins are also known as millwork, and are a great means of maximizing wall space, especially in a small space. Millwork can be utilized to encase a window or doorway, again maximizing storage or display space. 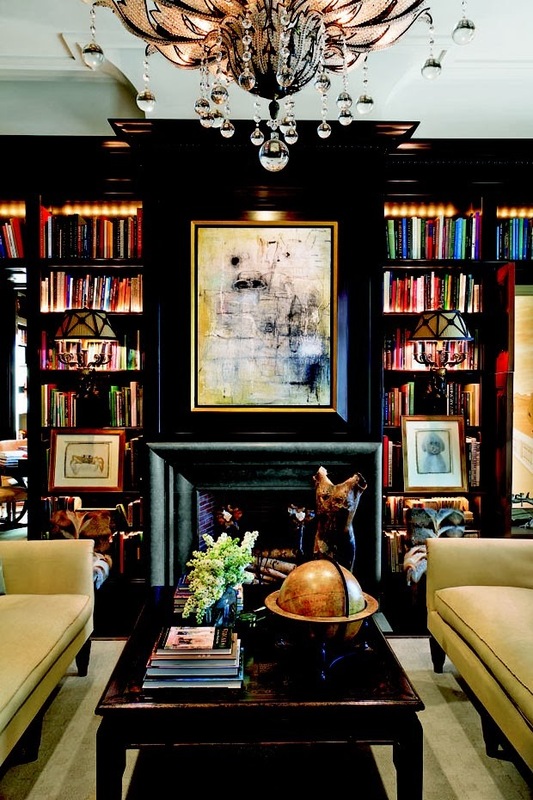 A custom bookcase can also create a show space to hang a dramatic piece of art, creating a focal point in a room design. Customized built-ins are also a great means of building extra seating into a small space, particularly under a window, with bench seating - for example in an eat-in kitchen, a child's room or a small office space. If you don't have the luxury of custom built-ins in your space, a large TV or wall unit can also serve as a great place to personality into your home with bookshelf styling. If you've just moved into a lovely old home model, the built-ins may be oak. A great way to update oak built-ins is to apply a popular home decor trend for 2014: Paint the unit the same color as the wall - including the crown and base molding - just use different finishes on the moldings. By doing this, you'll instantly bring a dated dinosaur from the 80's or the 90's forward into the millennium. If the unit doesn't quite reach the ceiling (similar to what happens with some kitchen cabinets) and you're ok on storage space, add a faux header and/or crown molding. 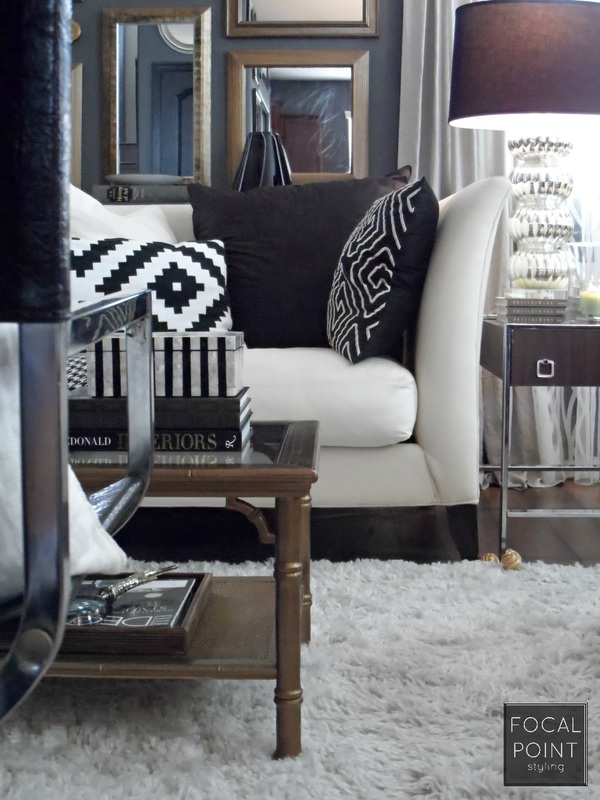 This will help add architectural interest to your built-in unit. 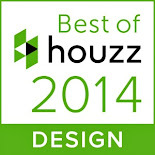 In either case, invest in hiring a local professional to help you update your existing built in with a custom look. 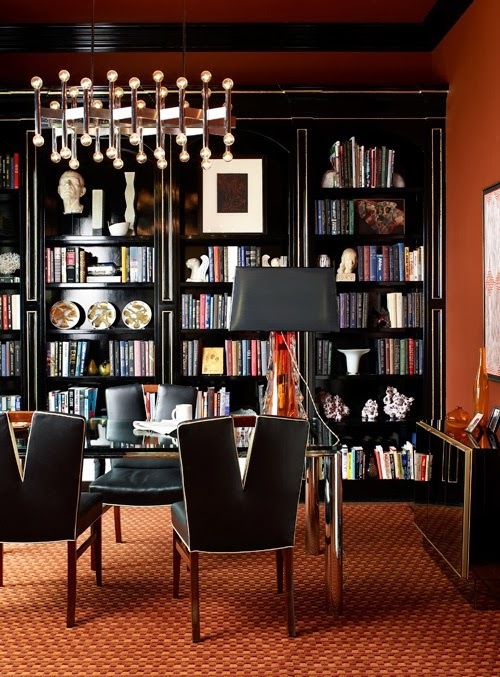 Although I have also seen (on the Internet) store-stock bookshelves encased with moldings to give them a more built-in or finished look, after anchored to the wall of course, a professional painter or carpenter can ensure a more flawless finish. 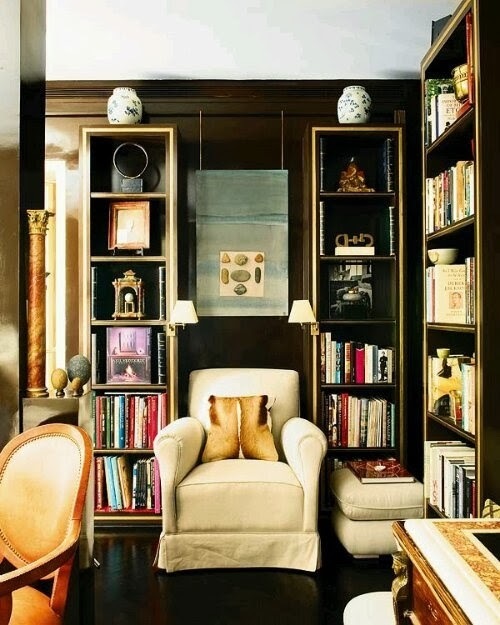 Interior by Slim Aarons - Lacquered linen bookshelf, one of a pair, from an auction of Brooke Astor’s belongings. It was designed by Albert Hadley, featured in the NYTimes. 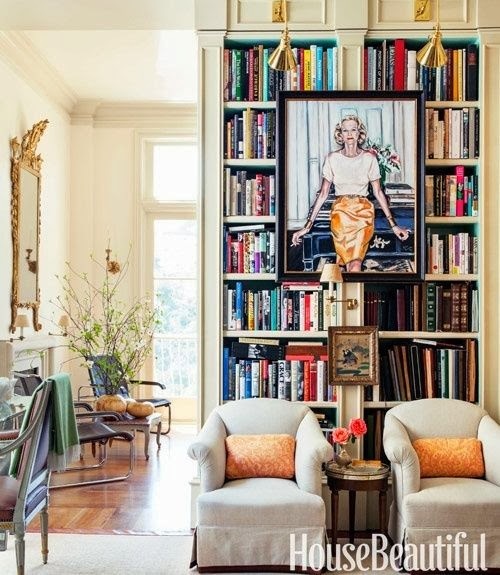 Art can be added to a bookshelf in two ways: tucked inside on a shelf and leaning or added onto a millwork unit. Either can create interest for the look of your book mix. 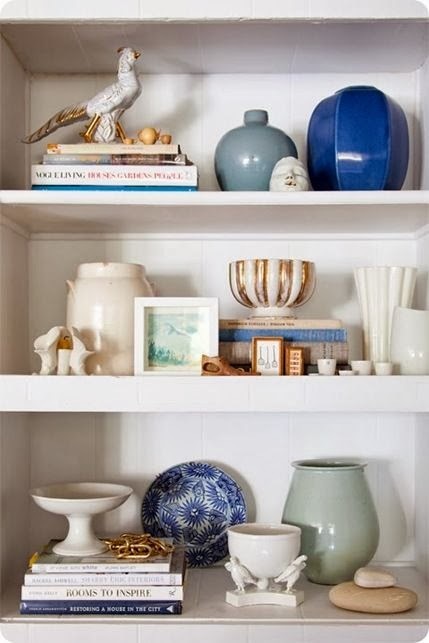 If your unit has adjustable shelves, try removing one shelf to house a larger wall art decor piece - a great way to break-up a heavily merchandised bookshelf. The eye needs a place to rest - whether in a store or in a home and wall art can help create that resting spot. 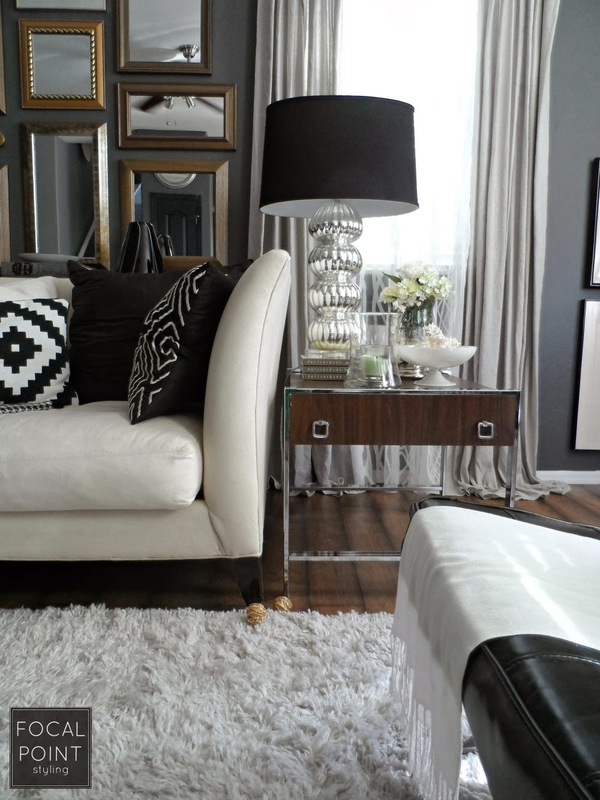 If you have a wall unit, alternate sections of removed shelves for art - this will give your wall rhythm. Smaller wall art can be tucked onto shelves, layered with smaller art or photographs and helps to give depth. Not all art needs to be framed: Rattan chargers or colorful plates can add pattern and interest, plus a round element to this otherwise very square territory. 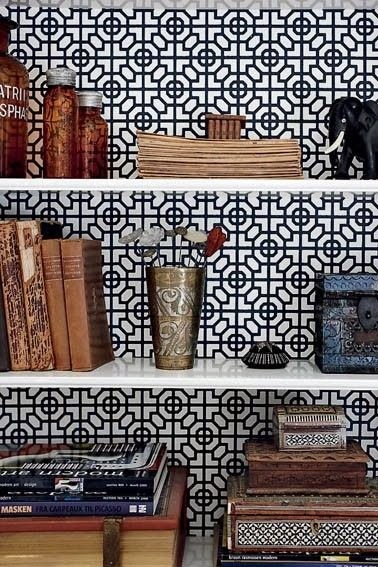 If you're non- committal to the wallpaper back inserts in a bookshelf, try adding framed textiles first to live with the look for a while. Another alternative to permanently adding pattern to the inside of a bookshelf is to cover pre-measured foam core inserts. If you don't adjust your shelves and you're a lover of changing your home seasonally - this may just be what you're looking for. If pattern is too much, but you're still looking for a little 'oomph' to your unit: try adding texture with bead-board or textured wall covering insert covered in grass cloth (usually $35 a roll, available at Lowes). 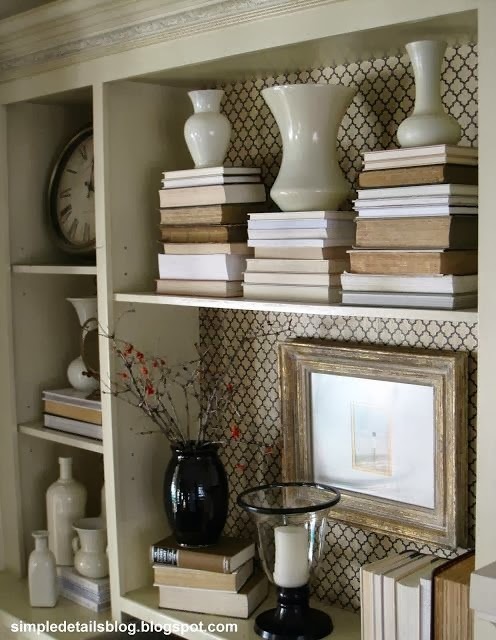 An uber inexpensive means of adding texture or pattern inserts to a bookshelf unit can also be to use wrapping paper. HomeGoods has an amazing Faux Boise wrapping paper in B&W for only $2.99 a roll). Whether you would love to travel or you have done some traveling, a bookshelf is an excellent place to showcase your travel stories - maybe even include books wrapped with maps or frame vintage maps or locations you've traveled to. 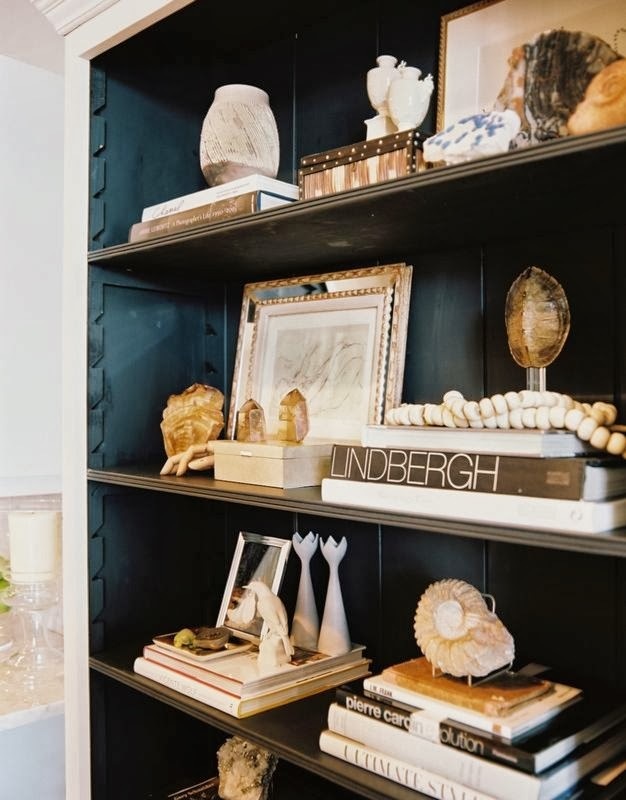 If you've relocated inland after living on the shore most of your life, a bookshelf is the perfect platform to display your beach-chic passion. A sophisticated mancave may use a mix of motor vehicle books, car models, and photographs to display his passion as well. 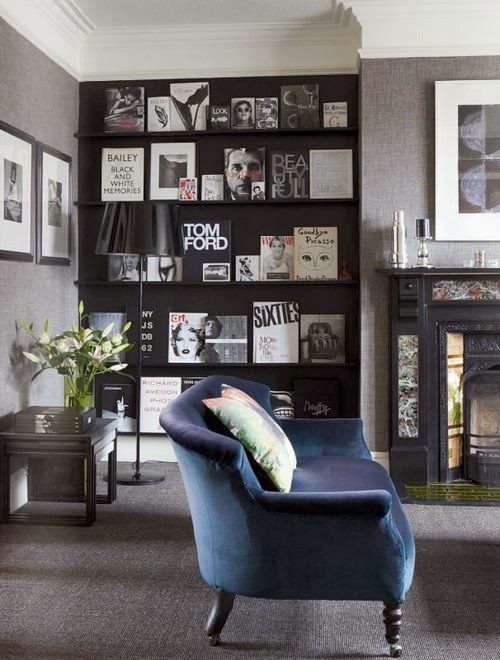 A bookshelf can also be a means of displaying a photo gallery of vintage family photos - you know the ones - odd shaped, sepia toned or B&W, sometimes dog eared or curling. Mix these family photos with conversational keepsakes and covered baskets to conceal storage - letting these treasures be the story on your shelf. 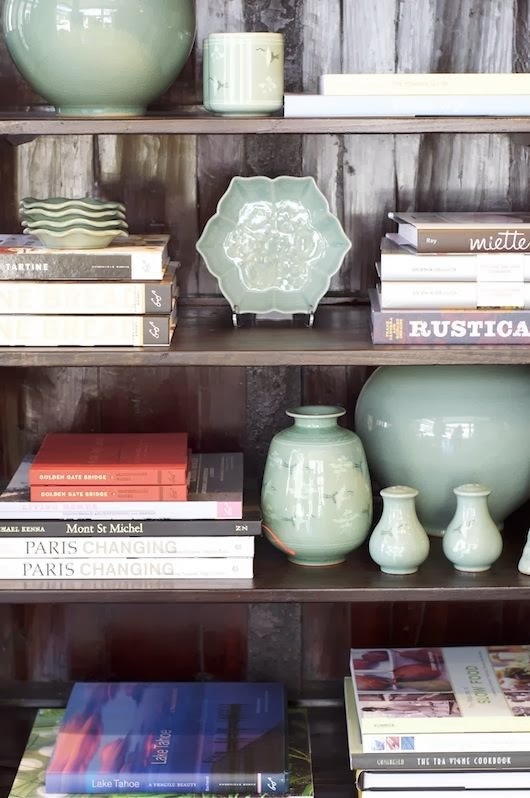 This type of shelf styling is also a good place to turn books in reverse to capture only the pages for texture. BOOKS: STACKED. STANDING. COLORIZED. CATEGORIZED. Now a days, there are so many options when it comes to displaying books. Personally, I like the mix of color-blocking and categories (although my color-blocking is usually black, white, grey or blue.) Color-blocking can be achieved by simply removing the books dust jacket. 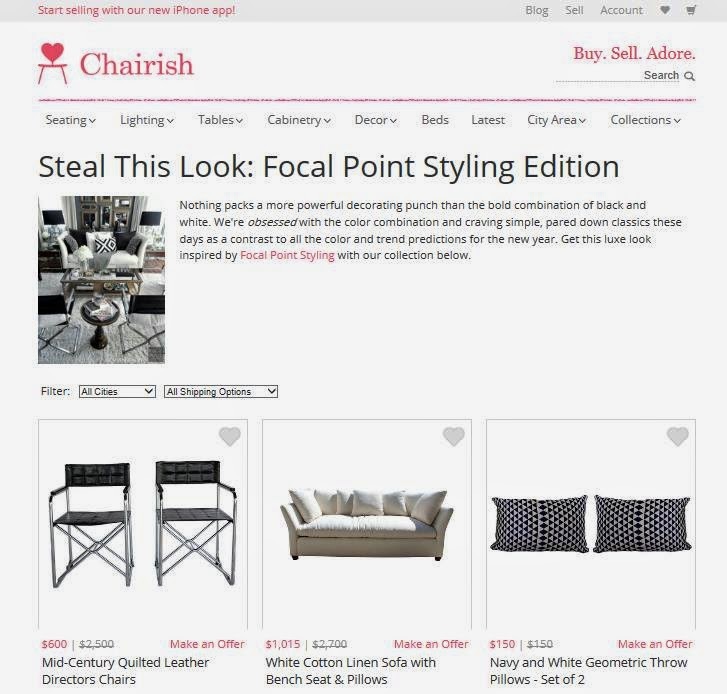 If you're looking to create solid white stacks (especially for spring / summer styling) just flip the dust jacket - it's usually already the solid white you need. But sometimes, the dust jacket imagery can act as art itself - as an option to stacking or standing books spine side out, face front books for added interest. This technique can be especially fun in a child's room, or work in a design office lobby. If you have perfect penmanship, write book titles on the whites of the book jackets - if not, print titles or use a label maker for a crisp, clean look. 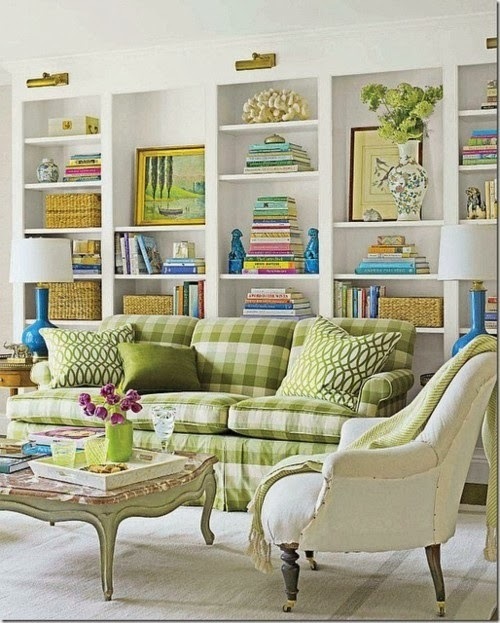 Stacked books are great to use as "risers" in shelf (or coffee table / vignette styling). 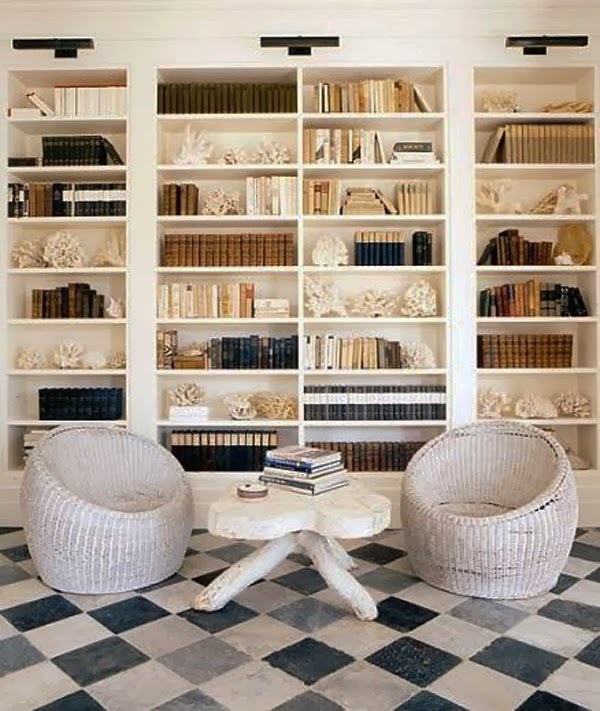 Stacked books become a platform to feature a bowl of pearls or shells, giving personality to your bookshelf styling. 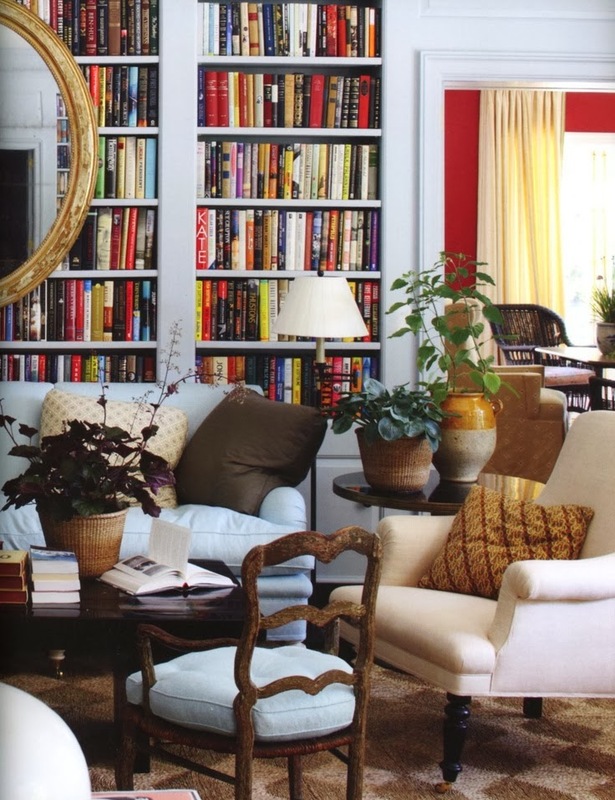 If you're maximize book storage space, try alternating stacked and standing books on shelves (retailers and showrooms sometimes will do this with pillow walls). 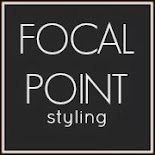 This technique helps to add texture to a book styled wall. 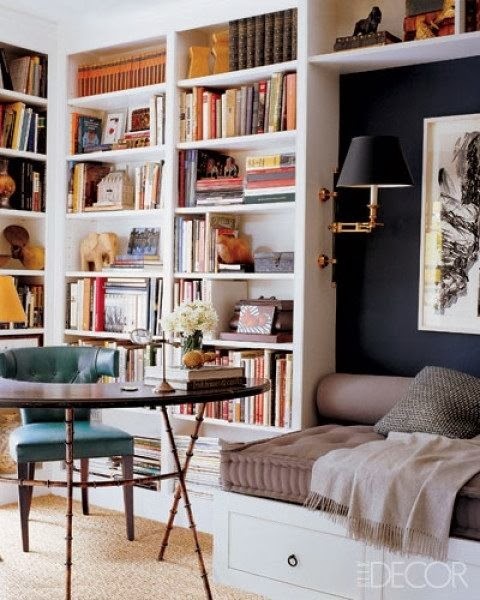 When all is said and done, whether it be styling bookshelves, or reading all the fabulous books you've collected over time - one element, one very important element is required for successful bookshelf style: Lighting. 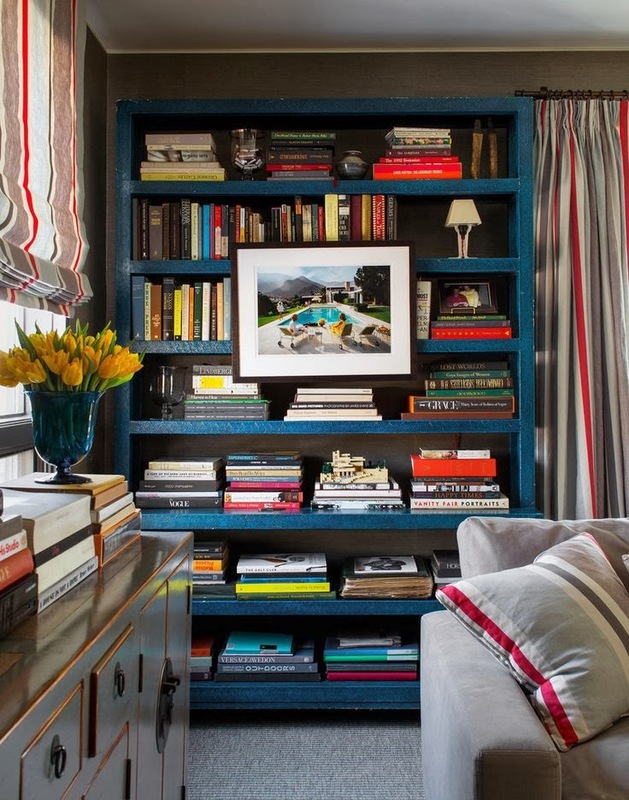 Built-in bookshelves can tend to bring a heaviness to a room. Lighten the load by washing (or grazing) your bookshelf styling with lighting fixtures, set at the top of your unit (such as picture lights or library lights). 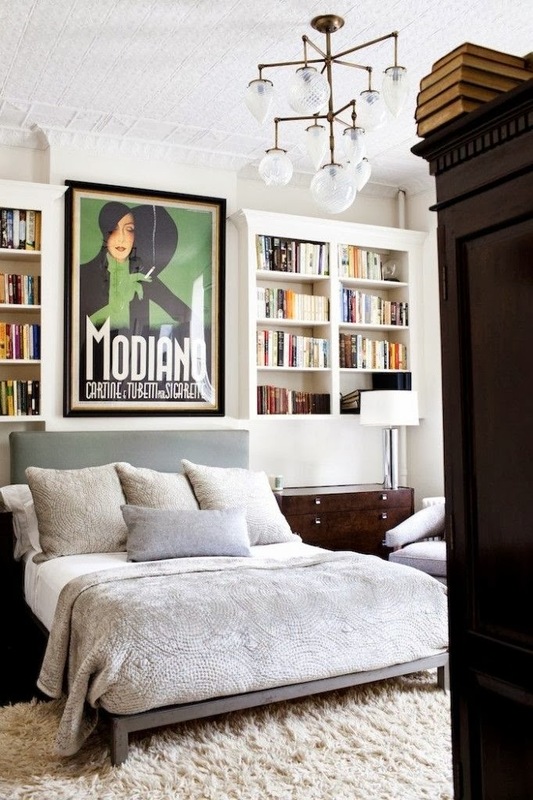 Open bookshelves can also be washed with lights by using a swing arm lamp mounted to the wall. Another option to bookshelf lighting is to light each shelf (think hidden strip of light, such as under the counter lighting). 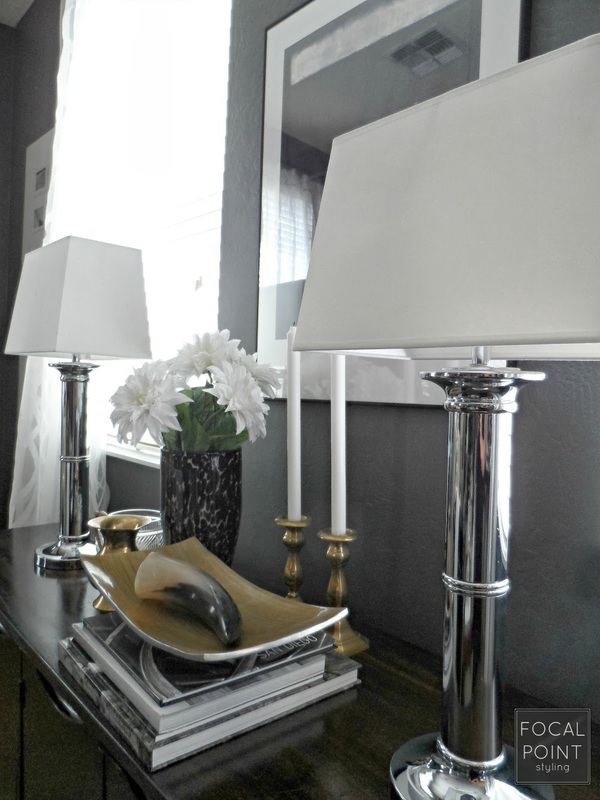 These lighting techniques can add ambiance to the room, but don't over-look the importance for proper task lighting, especially in a window-less room, void of natural light or for evening reading. 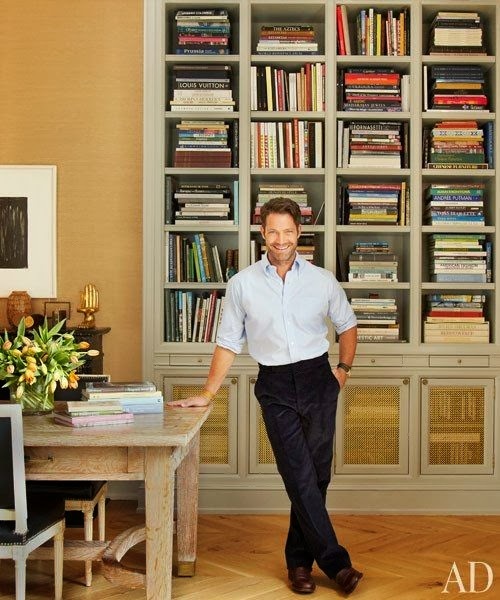 I hope you're inspired as much as I am to re-do your bookshelves, with style!